A crisp trim in textured grosgrain ribbon adds the perfect touch of style to this off-white lamp shade that features a custom fitted harp. 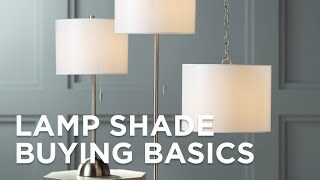 This trim and crisp drum shade is versatile and perfect for any lamp. Off white grosgrain ribbon trim on top and bottom completes the look. 15" across the top x 16" across the bottom x 11" high. Off white fabric. Grosgrain ribbon trim. Drum shade design from the Brentwood brand. This shade was the exact size and color we were looking for. What is not a spider fitter? BEST ANSWER: Hi, a spider fitting is the type of fitting of the shade. It generally has 3-4 spokes across the top and secured to the base with a harp and finial. What is a spider fitter? BEST ANSWER: Hi, spider fitting is the type of fitting of the shade. It has 4 spokes across the top and secured to the base with a harp and finial. is the shade just fabric or fabric glued to a more rigid type material? BEST ANSWER: It has a stiff clear plastic liner on the inside to maintain the rigidity along with the wire rims at top and bottom. The fabric is glued to a more rigid shade and has not come apart in the year I have had it. It is fabric over a rigid material, so it is NOT fabric alone. is this just a fabric or fabric glued to a stiff type of backing.? BEST ANSWER: Hi - this is considered a hardback lamp shade and adhered to a stiff backing. I'm no expert, but I would say it’s a fabric adhered to a stiff, plastic type ( typical of most shades) of material. The grosgrain ribbon is glued to top and bottom. It’s a really nice shade, we are very happy with the look and quality. Fabric bonded to a stiff, translucent substrate. Nice shade. Fabric glued to a stiff backing. Is the color more white than off white? It's off-white as described. I like the color. It's more white than off-white. what type of material is this made of? linen? faux silk? BEST ANSWER: This is a really nice fabric, more linen with a slight feel of silk to it. It is not dry and dull like linen seems to be. I like my shade and the way the texture shows when the light is on. It has a textured linen look! Definitely not a smooth silk look! It appears to be more of a linen than silk to me. Color was not "off white" but very WHITE! 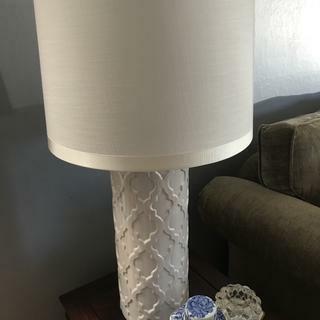 I needed an offwhite/ivory colored lamp to blend with the floor and moldings in the room, and yet contrast against the warm colors of a picture that the lamp is sitting in front of. It is just the perfect color and size. Also, the dresser it is sitting on, has a side to it, that sits on top of the dresser, to make it an L shape. This lamp, placed on the right side of the dresser, balances out this large dresser perfectly! Wonderful shade at great price. I revamped a couple of traditional looking brassy lamps by spray painting them with a hammered dark brown spray paint. Then, I added this shade. It gave the old lamps a new life as with a more transitional look. Couldn't believe I ordered a lamp shade on line without actually seeing it first. Really took a chance on the color and size. WELL, to my surprise it came "perfectly wrapped", the color was great and the size couldn't be more perfect. I'm now considering replacing another old lampshade too!! Great value for the money. Very attractive. Softens lighting. I am so glad to have found perfect shade. Looks great! Staff exceedingly polite & helpful in my search. We were staging our house to sell and needed to brighten up a corner with dark wood shelving. 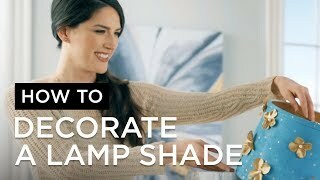 This shade worked perfectly since the floor lamp was silver-toned. Looks great. House sold in one week! I cannot say enough about the extra attention given to packing and safely securing the shade in a very sturdy box. I looked many places for a classy neutral shade and even purchased some which I returned, elsewhere. I shouldn't have looked further than here, they are perfect and can be elegant, modern and clean. The grosgrain ribbon is a lovely finish. Great modern look to my room! Very nice, well made shade. Lovely, shade. 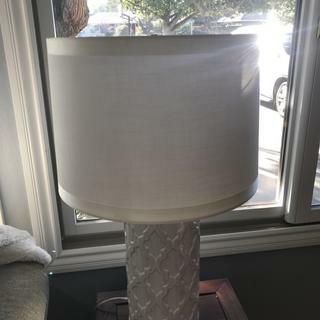 Fits well on the floor lamp, adding to the overall appearance of the lamp. A clean and fresh looking white drum lamp shade with an updated modern shape.